Cruel wolf kills across Europe, who cares? 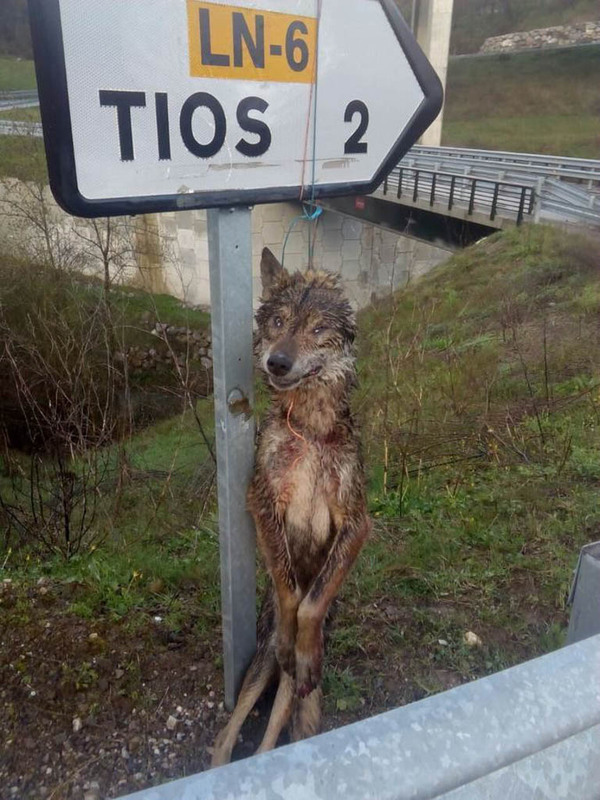 The body of a wolf hung on a traffic sign in the municipality of Lena in the spanish northwest area of Asturia – with a shot in the neck; a wolf shot, decapitated and cut into pieces in Brandenburg, Germany. Since 2000 in Germany 12 wolves were proven to be illegally killed, and no one persecuted up to this day. At the same moment when it comes to wolf and human coexistence issues most eyes focus on Sweden and its unclear, EU unconform wolf policy, we should switch our focus also to other european countries which are probably even more worrisome. In Austria there is no reasonable answer to why no pack was able to establish so far., Latvia hunts especially pregnant female wolves to maximize the losses, in some areas (Kantone) of Switzerland local administrations want to hunt wolves just because they are supposedly a danger to sheep, France is turning a blind eye on illegal hunting and even allows a yearly arbitrary quote of about 10-12 wolves to be shot and last but not least Spain which has just allowed the killing of almost 200 wolves. All of this concerns an animal that not only is supposely strictly protected but also the center of millions of grant and subsidies money from the EU, government, NGOs and private funders for compensation of possible livestock losses by wolves. It obviously raises the question why no one is pursuing these acts of crime against a threatened species. The question really is why we protect an animal and then hesitate to pursue the people breaking the law. It is unacceptable to let legislatural space for local governments for interpreting the protection criteria to their advantage. This is generally valid for any law, but even more so for a species like the wolf, who can travel hundresd of kilometers, crossing x borders of x different juristictions and countries and hence opening the chance for undoing the protection status within one area while travelling through an area which internal agreed on hunting. The European Wilderness Society is urging for finally executing the law and persecute violating. This is not a a peccadillo, this is crime. Wolves are innocent creatures who been the target of being VILIFY so they can be MASS MURDERED!!! for the hunters adrenaline disease and the greedy farmers. The CRIME done to wolves is the most despicable and SATANIC act that human does, and the target been the INNOCENT WOLVES, which genetically is the grandparents to our beloved dogs. I will NEVER AGAIN BRING ANY OF MY TOURIST DOLLARS INTO YOUR COUNTRIES AGAIN… I toured 8 countries in Europe once. Shows country full of HATEFUL PEOPLE. Important to point out how many dogs attack and even kill humans ( unlike wolves0. Also look at the tourism money that wolf watching brings to local communities.And look at EU costs to have far too many sheep in EU countries and the damage sheep cause to eco-systems. I am so glad that I’ve finally found a website like this that is talking about the wrongness of wolf cruelty. So many websites have bloody pictures, talk of violent crime scenes and horribly over-exaggerated pictures showing wolves as violent, evil creatures. I even found one that was talking in exact detail about how a girl died from a wolf attack… out in the middle of nowhere… how the wolves surrounded her and made the kill slowly… and how do they know that, When no one else was there? When there are hundreds of other possibilities about how that could have played out? They didn’t have any important information and didn’t say how they got theirs! Thank you so much for posting some truth, shining a little light on this controversial subject. I’m here for the facts, and you could provide that. This is sickening. My stomach hurts just reading. Please push for law enforcement! ALL WOLVES AROUND THE WORLD ARE ESSENTIAL TO THEIR ECOSYSTEM. BESIDES THAT THEY ARE GOD’S ANIMALS! , HE PUT THEM HERE FOR A REASON!. SO LET THEM BE N LIVE THEIR LIVES AS U DO UR’S!! !